Anyone know what boss drops this jewelry and where he spawns? TheListener wrote: Anyone know what boss drops this jewelry and where he spawns? Those drops are from an event boss a few years ago. 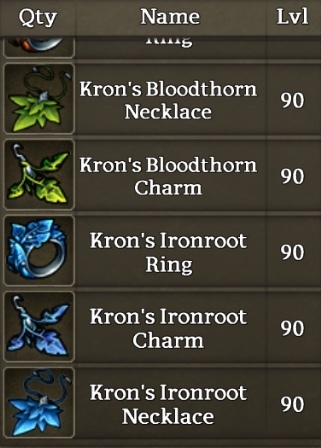 The boss (Kron) is now in the legacy boss list, which means that it has a spawn timer of every couple weeks (give or take a lot). I’m not sure where he actually spawns though...someone else is gonna have to answer that. There are lots of other legacies of a similar level lurking in Murky, they're great fun to hunt out as well. Goodies (bitey) has a complete map on his website as well.